• 5 Pcs Car Upholstery / Trim Remover. • Precision tooling ensures damage free removal. • Removal of upholstery clips, trims, moldings and wheel hubs of cars, vans, utility vehicles. • Fiber glass any soft nylon construction prevents scratches or damage to panels. • Extra-large support area provides maximum leverage with minimal force. • Includes wide, narrow, pull and handle type removers and upholstery clip remover. • Used by well know German, Japanese and European Car manufacturers. 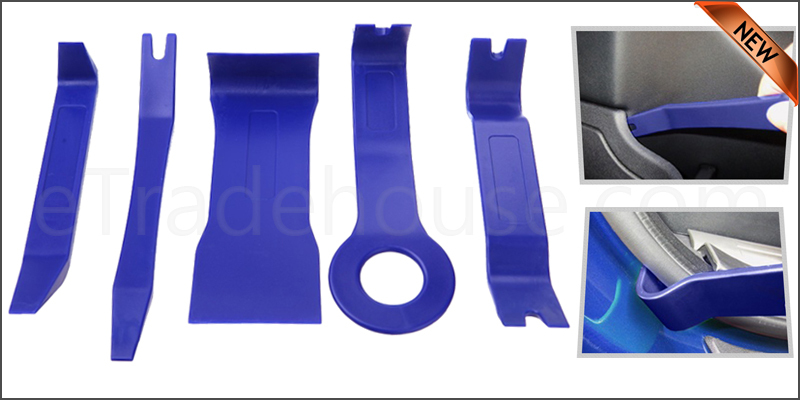 5 Piece Car Door Plastic Trim Panel Dash Installation Removal Pry Tool Kit.